Today I have a surprise for you all. As part of Bloomsbury’s #Weightless Blog Tour, I have a guest post from author Sarah Bannon to share with you where she shares stories (and photos!) of her own high school years! 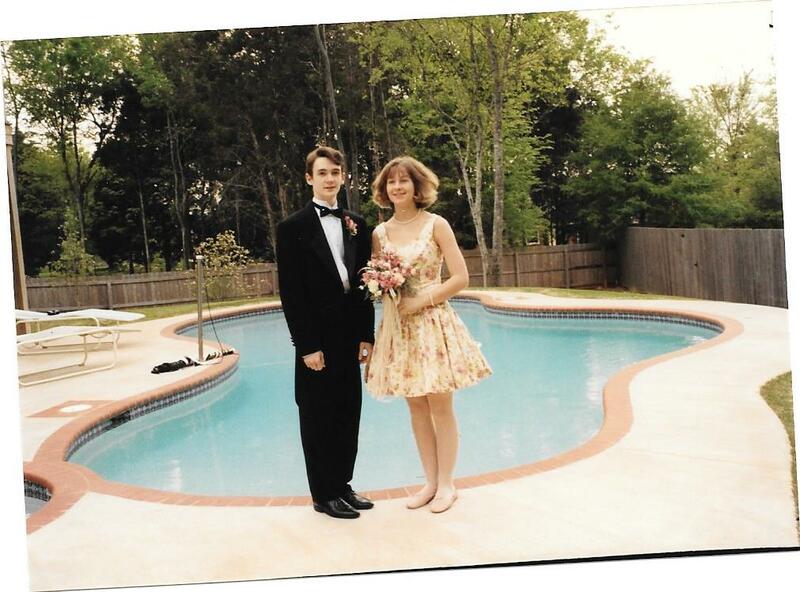 Most of the photos I still have from high school revolve around dances. They were a big part of our lives back then. 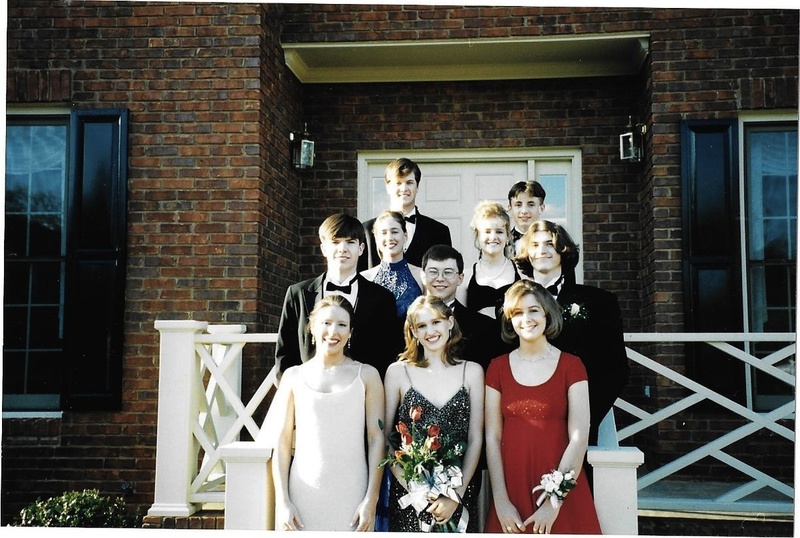 We had two every year – Homecoming and Prom – and the sororities (yes, my high school had sororities) held three or four other dances throughout the year. Winter Formal. Spring Fling. Hay Ride. Yep, we actually went on hay rides. Even though my friends I thought we were vaguely above all of this nonsense, we still wanted to go. We still planned obsessively. We still dressed up and did our makeup and did our nails and our hair. I don’t think I ever attended a dance with anyone other than a friend – which was a source of disappointment to me at the time – but, looking back, I think that’s why we always had so much fun. Less pressure. More laughs. More dancing. Senior prom! A snap of my friends and I heading out…picture is in front of my house and I think all of us – with the exception of one couple – were going as friends. We went to Cracker Barrel for dinner, in an attempt at irony…and we all came back to my house after the dance and stayed up all night. My mother served us breakfast the next morning…and it’s only now that I realize how totally awesome she was and is to do something like that…! A cringe-inducing photo of myself and one of my best friends from high school, taken during the summer after my senior year. I was madly in love with him all through high school, but it was never to be! I thought I had kept the crush a secret at the time, but I have now learned from him he was fully aware of all of my not so subtle hints. I’ll be forever grateful for his kindness! 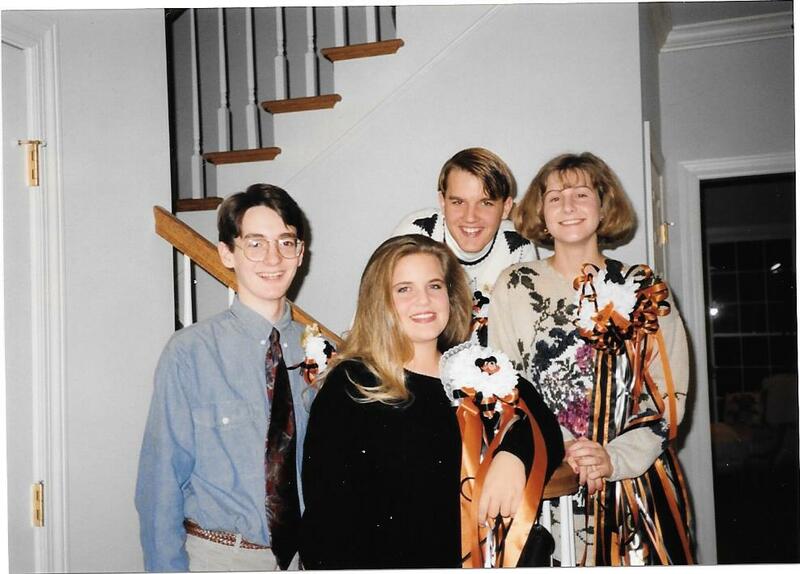 This is my freshman year of high school, and the four of us are headed out to the Homecoming football game and dance. Yes, those shrubs attached to us are corsages. Apparently, they don’t do these in our town anymore. WHY, I just cannot imagine. We had a blast and we were all just friends, which is probably why it was such a great night. 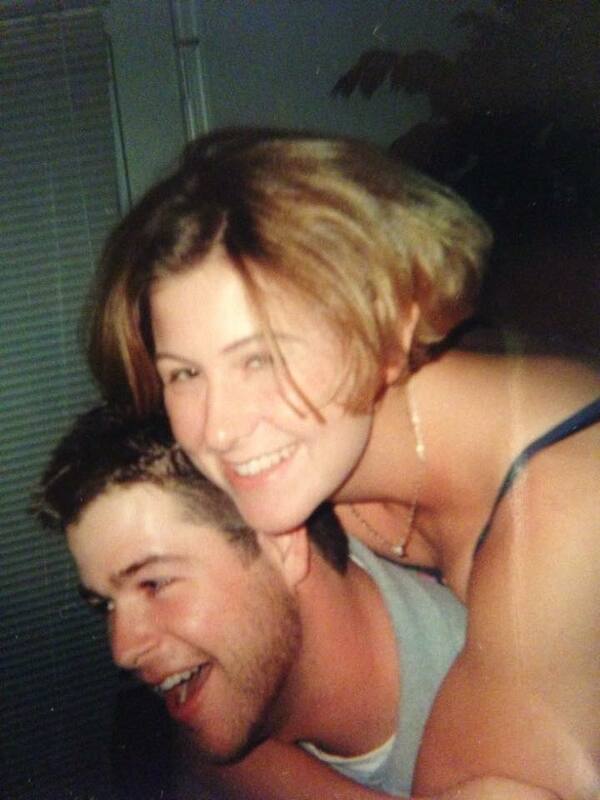 My friend Leslie and I thought we were pretty spectacular as our dates were seniors and we were only freshman. Pity about the things growing out of our sweaters. And the state of my hair. Okay, now onto my review for Sarah’s novel, Weightless. Weightless is a book which intrigued me. Bullying is not anything new but Sarah Bannan manages to deliver a refreshing new take on the subject by showing how damaging social media can be when used maliciously. Also touching on topics such as mental health and self harm – Weightless is a powerful read and one which really made me stop and think. The narration took a little getting used to for me. Told from the perspective of the first person plural with no one character being the narrator, it is different. There will be people who love the unique view and others who will be uncomfortable with the lack of a single narrator and fail to connect with the characters as a result. Personally I thought it was the perfect way to tell Carolyn’s story. The teenagers in the small Alabama town seem to subscribe to the same hive type mindset and because of the choice of narration this is present in every sentence of the book. What I found most powerful about Weightless is how relatable it is. This is a book set on the other side of the world to me with characters a decade younger than I am and yet as I read my way through Weightless I felt as sense of connection. The story, whilst fictional, is so very real and could be happening to anyone anywhere. Cyber bullying is becoming more of an issue with computers and technology being so important in our day to day lives. Sarah Bannan does a brilliant job at capturing how dangerous the group think can be online. Weightless is a thought provoking read which made me think and question the dangers of technology. This book is different – not only for its unique narration but also at how it portrays sensitive issues prevalent in society. 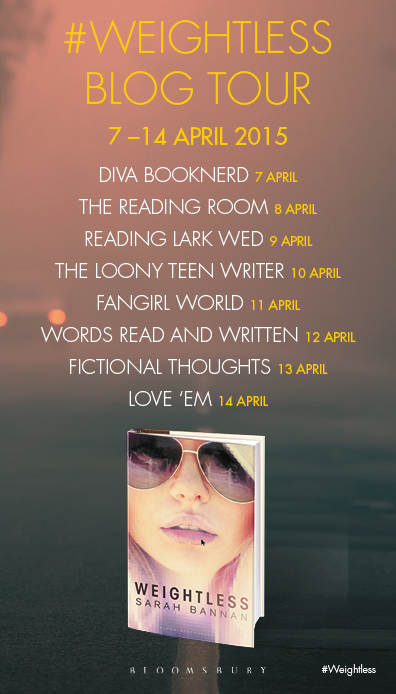 And be sure to check out other blogs in the #Weightless Blog Tour for more! are done well, they can be very heartbreaking and therefore difficult to read–but I might just have to give this a chance. The narration style sounds interesting, too. Great review and guest post! This does sound intriguing! The premise is definitely intriguing and the guest post was such fun! Thanks for sharing and reviewing! I’ve been stalking all the other blogs on this tour! Haha. Loved this book, it had such an interesting plot line, I couldn’t believe someone hadn’t thought of it already to be honest! !